I never knew that this website existed!!! I am super, dee, duper, so excited about this as "Keeping Up Appearances" is my all time favorite show. I can practically quote all of the episodes. I even bought the entire series. 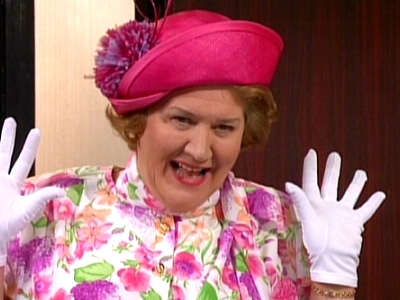 All of the characters on this show are wonderful, but my all time favorite character is Patricia Routledge. I can safely say that if I ever met her I can die a happy woman! This show has even inspired my life and the characters, in this show, have affected my life as well. I know every show by memory. I was excited to find out that they show it on Netflix. I lost it for a while and was very sad. When I lost the show on Netflix it is then that I decided to buy all of the episodes. Through this show I started to investigate the other shows Roy Clarke and Harold Snoad have done and I am just so pleased by them. I love their work! Anyways, I live in America; more specifically Texas. I am a huge fan of British comedies and one of my dreams has been to visit England and Europe. My mother is actually from Germany. My family knows that I love Keeping Up Appearances and my husband has watched every show with me. I am happy to be on this website and look forward to investigating it further. Thank you! Glad to have your presence on the forum. Welcome. Home is where Hyacinth is! Welcome,mijn vriend genieten van het forum hopen u te zien rond . Welcome! I'm glad you enjoy the show as much as we do! I'm so pleased that you've found us, you sound like a massive fan! Welcome inside the Bucket residence Salina! I am sure you won't, but please don't brush up against my wallpaper, I hate it when people brush up against my wallpaper.